So you have a taste for Italian food? You’re not alone. In fact, it’s a safe bet that some people go on vacation to Italy more for the food than for the architecture. After all, if the Italian restaurants here in the US are great, then the authentic ones in the mother country must be out of this world, right? In a way, it is right. It’s been more than a thousand years since Italians started their quest for culinary perfection. But be warned, the food culture in Italy is not quite what you may find in your neighborhood Italian restaurant in the US. So if you’re going to a restaurant in Italy, here are some rules to follow so they don’t think that they’ve let in a barbarian through the gates. Think of them as commandments! You will not find any ‘pollo’ in an Italian restaurant unless the place is explicitly offering American comfort foods. If you do ask for it, they’ll ask you which Alfredo you’re talking about. But if you have a hankering for pasta in cream sauce, just check the pasta dishes and find the ones that have “Panna” (cream) as one of the ingredients. That dish is purely an invention of Italian immigrants in the US. In Italy, spaghetti is an appetizer so you can just order spaghetti with meat sauce (“pasta al ragù”) as your first course. Then for your second course, you can order meatballs (“polpette”), which is typical enough. Just don’t order them both so you can mix them together—that’s horrifying to the Italians. You’ll be offered a bottle of wine and a bottle of still or sparkling water. Don’t ask for lemonade, soda, or iced tea. 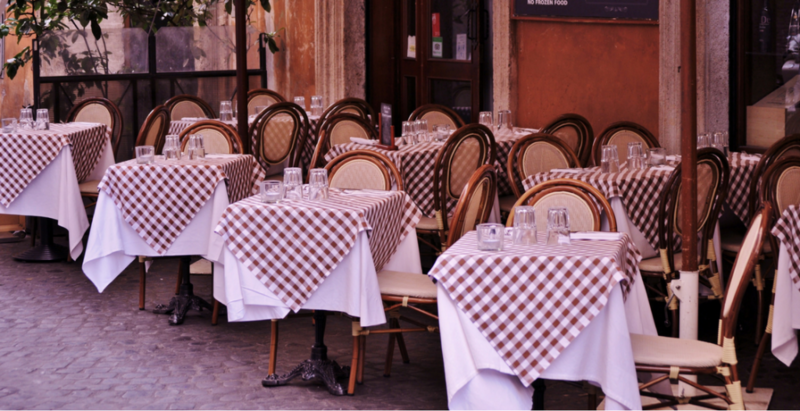 The Italians regard the taste of their food very seriously, and soda or iced tea will surely affect how their delicately prepared meals will taste. Restaurants do offer liquors and cocktails, but they are not for consuming during the meal. They’re either for before dinner (“aperitivi”) or after dinner (“digestivi”). However, if you’re eating pizza then it’s perfectly okay to have a glass of coke or beer. But just one glass. It’s acceptable to use olive oil, but that’s it. Again, keep in mind that the Italians eat chicken to taste the chicken, and not to taste the ketchup or gravy. They don’t put mayo on their sandwiches, and they don’t put ranch dressing on pizza. The point of condiments like olive oil is that they enhance the flavor of the dish, instead of masking it with the condiment flavor. So if you decide to buy some condiments for your home meals in Italy, you’ll have to look for the “exotic foods” section in the grocery. Italians call it “Olio e Aceto”, and you’ll have to experiment a bit to find the right balance. The best choices are a cloudy green olive oil and aged balsamic vinegar. Ask for ranch dressing and French dressing in a restaurant, and they won’t know what you’re talking about. The same goes if you go in a grocery store and ask for the salad dressing aisle. There’s just no such thing. Cappuccino is not for other meals, or even for after lunch or dinner. It’s not for your afternoon break either. For that, you do as the Italians do and drink black espresso. That’s a typical drink after a meal or just for any time after breakfast. That’s just weird for Italians, and their expression upon seeing you eat scrambled eggs for breakfast will probably look the same as your expression if you ever see people eat monkey’s brains. Italians eat eggs, but only as hard-boiled eggs for their lunch sandwich or salad. Or they eat open-faced omelet (“frittata”) for dinner. However, you can always have a ham and cheese toasted sandwich for breakfast. How does that even make sense? Well, in Italian restaurants in the US (they may even call themselves “ristorante” for authenticity), some people pour some olive oil and vinegar, on their plate, sprinkle it with parmesan cheese, and then dip the bread inside. But that’s an American way of eating. That’s not going to fly in places where they serve plain Tuscan bread since it’s made without salt. Instead, Italians do the little shoe with it (“fare la scarpetta”). This means they use the table bread as a utensil. It’s used to mop up anything left on your plate and any bits you can’t get at with your fork. It’s actually not food you eat alone. It’s why it’s tasteless—the taste is in what’s your plate. If you are ever in an Italian home, don’t scarf the food down, and don’t ever suggest eating in front of the TV. You have to understand that lots of Italians take so much time preparing dinner, so they want to savor every bite. In restaurants, it’s the same thing. The service will be slow and there will be lots of courses. It’s unheard of for a waiter to come to your table to hurry you off because they supposedly need your table. If you’re in Italy, you have to set a few hours for your meal. You don’t walk around the place eating a sandwich. You have to sit down and relax and relish each taste. A thousand years of culinary history have led to that meal—you just have to appreciate it properly.